The ‘inland sea’ of Lake Superior holds a special allure for area sea-kayakers and campers, and boasts a rich history both geological and human. 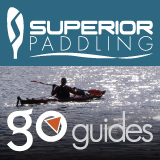 Largest of the Great Lakes, Superior is also the wildest, least predictable, coldest—and many paddlers argue—the most beautiful. Over 350 miles long, with over 30,000 square miles of open water and innumerable islands, much of Superior’s 2,700-mile shoreline has been preserved in the form of public lands, making it easy to visit and explore our national heritage.